NCEC is a mother church for many small churches in small towns and villages around Cairo. The church has strong relationships with these churches and to support them has set up a Social Committee and a Loan Programme. They operate separately and attempt to meet the needs of the poor in these churches. Some people are just so poor they need any sort of intervention and the Social Committee cares for them. Others have capacity for a micro-loan and the Loan Programme assists them. It is a comprehensive, co-ordinated attempt to help local people come out of poverty. BHW has been partnering with NB and International Needs (EGY01) since 2015. N is a member of this church and that same year he introduced BHW to the leadership. Over the intervening years BHW's New Partnership Facilitator has met with the church leaders four times and spent quite a lot of time with the key people of these programmes who he considers are men and women of great integrity. The church has been operating for many years and is the only evangelical church in Nasr City, a city of 3 million people (part of Cairo). They commenced the loan programme in 2010 and since 2011 more than 200 families have become involved with a payback rate of 100%. In January 2018 BHW commenced partnering with NCEC. The Social Programme benefits poor families in churches in the network of NCEC. These people are Christians that find themselves at the bottom of the social heap and often under pressure from the majority culture. They are usually uneducated and try to find work on a daily basis. They are very vulnerable and live in appalling conditions. There are many children involved as well as disabled, aged and unwell. The Loan Programme benefits all who wish to obtain an income, or increase their income, to meet the requirements of life, especially young people without work, female-headed households and widows who are able to work in order to start a new project or develop an already existing project. The capacity of the teams and the individuals is very high. They are an outstanding group of people. It is great to have a church with this sort of vision. Dr HS is a pharmacist business owner and thus experienced in trade and business administration which qualifies her to study the proposed projects of the loan borrowers and give advice on the best way to run the project. Dr H retired from her pharmacy business and moved to an apartment block adjacent to the church to oversee and develop this ministry with NCEC. She is very competent and committed to the project, it has become her life. Mr NK: an accountant and owner of a tourism company who is well experienced in accounting and financial management. He keeps track of accounts, collects payments and keeps the books updated. Mrs HF: a teacher and human builder trainer who has experience in enhancing human resources that allows her to move the loan beneficiaries from seekers to independent people. She is very keen to help people raise their own income which helps restore their dignity. Mrs AF: a lawyer experienced in checking the proposed documents and following up timely payments which helps keep the project going successfully. Mr MB: is highly experienced in technical work which allows him to guide the borrower in practical ways to help achieve the best results. To see poor Christians come out of poverty and flourish. There are hundreds of thousands of people in this situation. In their words, "economic empowerment that gives decision-making power to the poor and the needy by providing revolving loans which seek to give hope and to preserve the dignity of the poor through the creation of income-generating small projects or the development of already existing ones." In 2010 the church had a vision to help people with small loans but had no experience regarding how to do it. They therefore approached a company to train them and to set something up. They began at the end of 2010, just before the revolution in 2011. 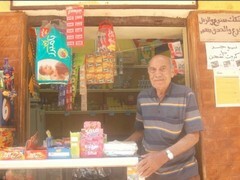 They began with EGP30,000 (US$5,000) and started lending it out. The timing was important because in 2011, when the revolution came, many people lost their jobs. They began by lending around US$100 per family and were very concerned that people were able to retain dignity. The strategy is to partner with the churches and the pastors in their local areas. The churches organise themselves financially and spiritually. Currently they are working in seven areas. The church does the follow up and prayer. The money comes back to the committee and they deal directly with the families. They charge 8% per annum interest. Each case is unique and they spend time getting to know the capacity of the family before determining if they are eligible for a loan. They have a committee of six people with various strengths (see Key People). The committee works really well together and meets twice a week. They meet the families, see the project, pray, read the Bible with people and preach the gospel to them. They also counsel them into better projects if required. They spend hours with each family before deciding their capacity. This group gives grants to very poor families. There are many widows who struggle to care for their children, many elderly who have no-one to care for them, and there are disabled people, often men who were injured in risky jobs, who are now unable to work and support their family. And then there are some with chronic medical issues who are not able to afford treatment or able to maintain a job. Many families have no furniture, beds, blankets or mattresses. They live in squatter accommodation with the whole family in the room of a benefactor. NCEC began a programme called "Family to Family" in which people in the main church that had a good income could contribute to the support of a poor family. There were a few families doing this but with the sudden crash of the economy, this local financial support has completely died. There is a committee of 12 people who go out visiting and meeting the families, praying, encouraging and assessing the needs. They meet weekly and each month go to an area to meet the families in that area. At any one time there are about 60 families being assisted but there are many more families who need help and who contact them. They work through local churches to identify vulnerable families. Sometimes after assessment they refer the family to the Loan Committee to follow up. They have some families out of the city in poor rural villages as well but are a bit reluctant to go too far out because of limited resources. They do not hand out money or cash - it is always goods. BHW's annual budget will be split between the two programmes with US$4,400 going to the Loan Programme and US$2,200 assisting the Social Committee. 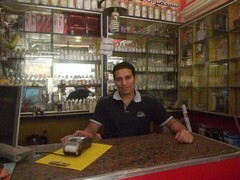 One boy got a loan of EGP250 (US$50) in 2011 and started buying perfume to trade. 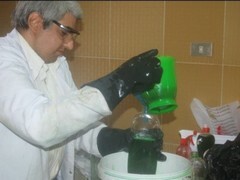 He now has a large business and imports perfume direct to supply large companies. A widow with two children trained to make candles. 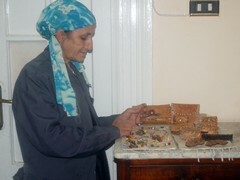 She got a loan of EGP750 (US$85) and now has a full-time business with her and her two daughters all working and receiving an income from it. They have many examples of successful families as a result of the loan programme. They have helped a number of women with older children to get jobs as domestic workers in more wealthy Christian homes. 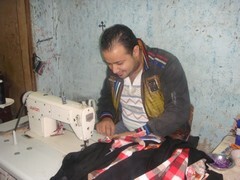 Some girls have been assisted to get sewing training and some have now got employment. They bought a tuk tuk for one family with an older son who now drives it as a taxi and earns an income. They sometimes help with school materials at the beginning of the academic year. One girl at university has her living costs covered while there. They sometimes help families if their daughter is getting married and they just cannot afford to meet their obligations.